Latest Pakistani Fashion Outfits for Women Over 30. A myriad of colors, styles, designs and affordable brands is what stitches the fabric of our culture when it comes to fashion for women. Our ladies do not compromise on snazzy, top-notch ensemble and there’s no stopping them. In the past few years, several designer brands have surfaced and many of them are affordable as well. The competition is severe. There is always a trend set that is followed with utmost dedication. From the past year, we have being noticing an onslaught of trends and that gives the women loads of style options to choose from. They say age is just a number but we women know pretty well that its more than that. We also understand that with age we have to dress more decently. 30 is when we actually start admitting that we have entered that mid-life crisis phase of life and regardless of that, some change needs to made even in our wardrobe. 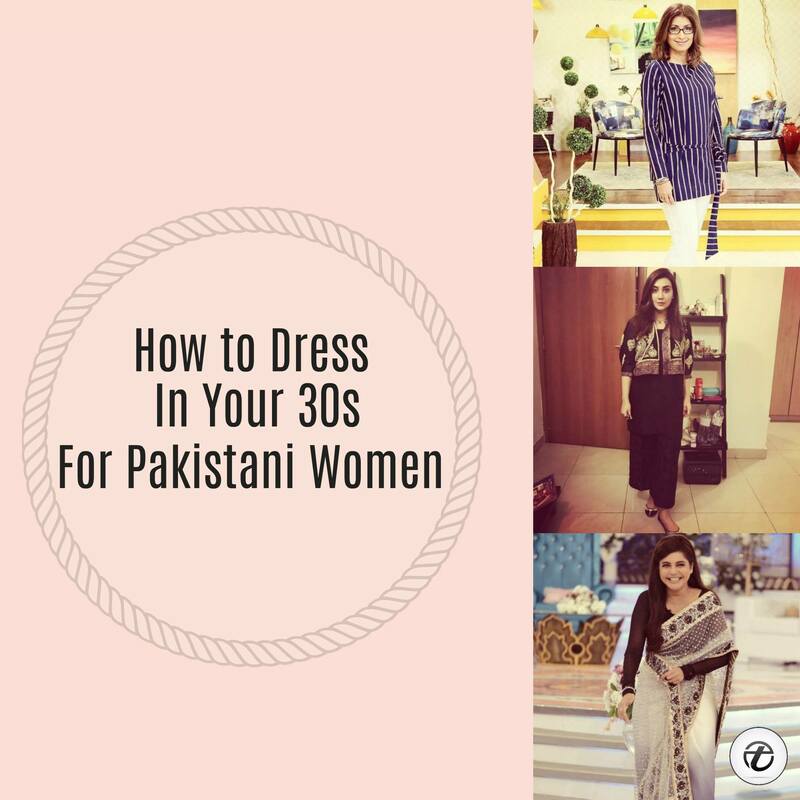 For all the Pakistani women who are above 30 years of age here is some attire inspiration for you. There are a lot of styles in vogue at a time. Wear one that suits your age. When you enter your thirties, it’s time to leave behind those short shirts and go for more elegant long shirts. At this age and onwards, you must avoid colors that are too loud or funky. After all, you aren’t a “girl” anymore. You’re a woman. Your body has changed too, so it’s better to let go of low rise jeans or cropped pants. Go for high-waisted straight leg jeans instead with a medium length, sober shirt or kurti. Keep away from high-low cuts and any clothing item that is too fitted. No more tights for you. Avoid thin and small dupattas as well. When you do not have any ideas, follow Pakistani style icons on social media and television and you will get a good idea. 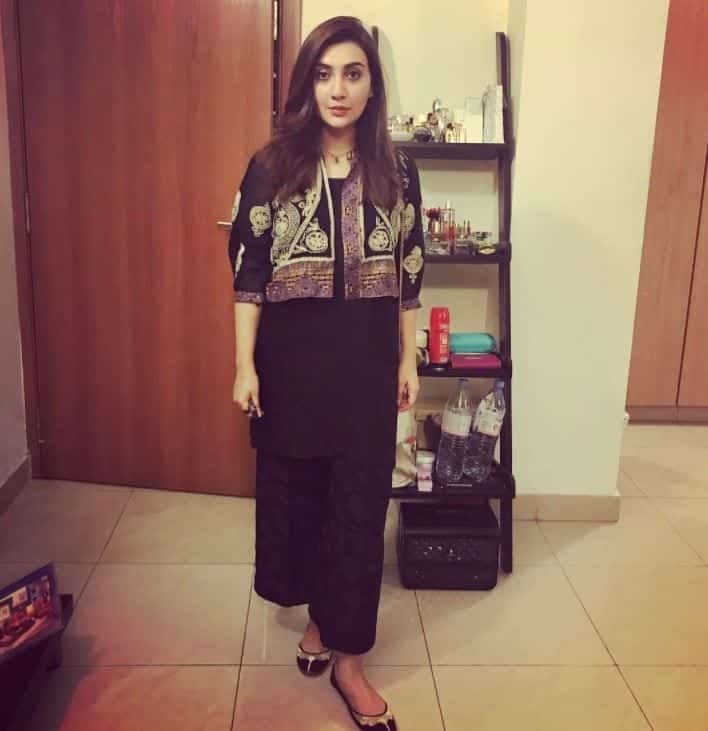 Ayesha Khan is currently in her early 30s and her style for sure is amazing. Here we see her wearing a black kurta and wide legged pants. The minimal embroidery on the jacket helps keep the outfit semi-formal so you can wear it to parties as well as for casual wear. She has perfectly matched the khussas with the embroidered jacket which completes the look. If you’re a curvy woman, then do check these 25 Plus Size Outfits For Pakistani Girls. When travelling, some women cannot decide if they should go for eastern wear or western. The answer is simple, when travelling in Pakistan you may wear any trendy desi outfit or you may wear modest western clothes. Abroad, though, calls for a pair of jeans with a tee, button up shirt or other such fab shirt style. Weddings in Pakistan are no less than fashion shows. And snazzy dressing is a major part of all the events. Chiffon, silk and other expensive fabrics with sparkly adornments are sported in classy designs by women. Here are 25 Easy and Gorgeous Hairstyles For Walima Function This Season. What you wear to work depends on your workplace guidelines. You can choose to wear any simple, sober and classy outfit to your office that adheres to the rules. Keep your hair tied with minimal makeup on your face and look flawlessly elegant. 30 is an entrance way to old age. If you want to go for a decent look, wear a muted tone. This off-white saari that Bushra Ansari is sporting is perfect with a bright blouse. Here are 14 Most Elegant Saree Designs with Saree Wearing Tips and Ideas. If you’re conscious about your look and think that a short top would look a bit too much wear a kurti with jeans. Here are 20 Ways To Wear Jeans With Heels. Party at a friend’s house? Or attending your farewell ceremony? There are several reasons for partying and there is no missing the best part; getting ready! Have a look at this wow party outfit sported by Sanam Saeed. She’s wearing Sania Maskatiya and there is no doubt she is slaying! Eid is that time of the year when we don’t care how we would spend our day, all we care about is how we would look. It’s all about shopping and preparations, racing from one shop to another in search of the best attire! Nail the perfect Eid look, by sporting the latest and most stunning ensemble. Check out Maria Wasti for some inspiration. Her dress in this picture is by Nomi Ansari. Don’t miss out these 15 Ways to Accessorize Eid Dress with Jewellery. In the warmer season wear lawn. You can wear a loose kurti with a tulip shalwar and look stunning just like Saira Habib does in this picture sporting a lovely dress that belongs to her own clothing line. Do have a look at these beautiful 18 Ways to Wear Palazzo Pants with Kurtis. Atiqa Odho with her sisters looking gracefully stunning. You can definitely steal some styling tips from these ladies! Here’s a list of the 15 Top Pakistani Designers for women. No feeling more amazing than sporting designer wear and looking your best. Here’s Sanam Baloch sporting a Layla Chatoor outfit. 30 might not be too young but it is by no means old. You can still follow all the latest trends with sass. Here’s Mahira Khan looking gorgeous in an AlKaram outfit. Current trend: medium length shirts with straight leg, cigarette pants or bell bottom ones with an intricately embellished dupatta. Want to look modern and chic? Learn some tricks from Areeba Habib; loose baggie shirt with tights, the striking look pulled off with confidence and completed with a pair of amazing heels. Heading to some posh event where you want to look your best? Take some notes from Reema Khan who is sporting an Umer Sohail outfit in this picture. Muted hues, mimilist design, high heels and high-end accessories would make you glow! Vaneeza always dresses according to her age. She’s always seen encouraging women to wear simple outfits and she follows this rule herself. Here too we see her wearing a simple striped shirt and minimal makeup but still making a style statement with the way she carries herself. This is a great look for day time wear. Because this year has been all about a number a styles instead of just one, go for whichever you think would suit your physique more. For the typical yet chic look, wear a cowl shalwar with a short shirt and dupatta. You are bound to attract the limelight toward yourself.